Presentation Evening, kindly sponsored by the WPI Group. 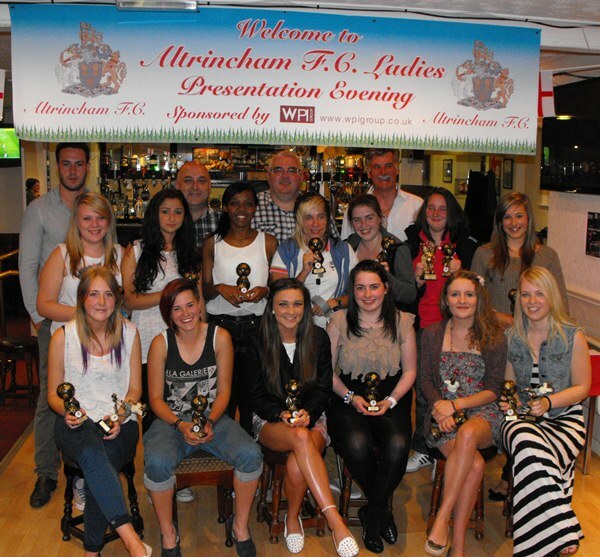 At the presentation evening for the Altrincham FC Ladies, held at Moss Lane on Saturday, 16 June 2012, manager Keith Edleston began proceedings by recalling a successful inaugural season in 2011-12 for his open-age team. Accompanied by fellow coaches, Rick and Jamie, as well as Altrincham FC Community Officer, Chris Bullock, Keith then revealed the award winners. Altrincham FC chairman Grahame Rowley made the presentations, which included an award for each of the players in addition to the individual trophies. In conclusion, the Ladies made a presentation of a framed and signed shirt to Grahame and Karen Rowley in recognition of the help given to the Ladies' team by the Football Club. Pictured below are four of the winners of the individual awards; (the fifth, Jaquie Farrar was unable to attend). If any of the team requires a full version of her image, please e-mail website, quoting the image number (found by right-clicking on image). Below, left: Karen and Grahame Rowley receive a signed shirt from the Ladies. Right, The management & coaching staff.